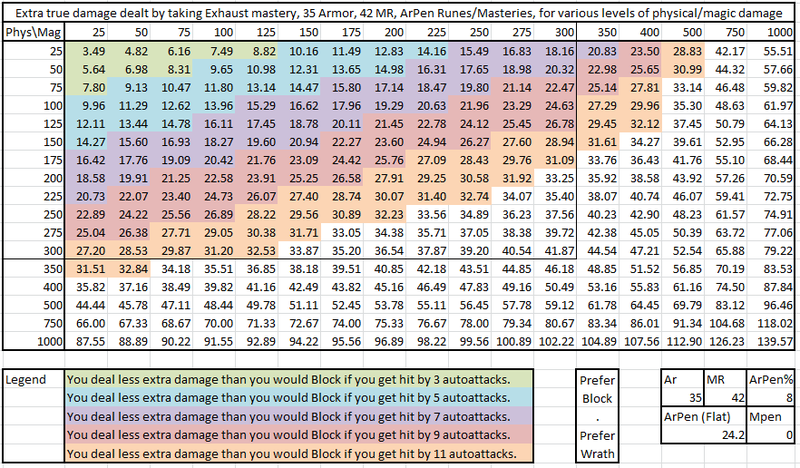 RheingoldRiver's League of Legends Blog: Summoner's Wrath or Block: Which Mastery to Take? 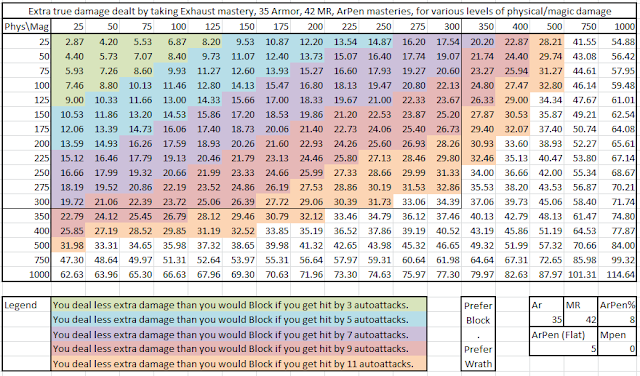 Summoner's Wrath or Block: Which Mastery to Take? Why are the selected (but not circled) points required? Having the extra 30 HP at level 1 is huge on every support, and so 9 points in defense is required. Additionally, having the extra 50 gold, explorer ward, and biscuit at level 1 are for the most part required. That leaves the summoner spell and item cooldown masteries; I consider all 5 of those points to be needed because it's important that your cooldowns of those spells/actives be no longer than those of the enemy support. The last four points can go into any of the circled masteries, with the two options that I usually take being 1/11/18 (Exhaust/Unyielding x2/Pickpocket) or 0/13/17 (Resistance/Unyielding x2/Block). Of these two options, which is better? Would we rather have Block or Summoner's Wrath? The answer is somewhat inconclusive. 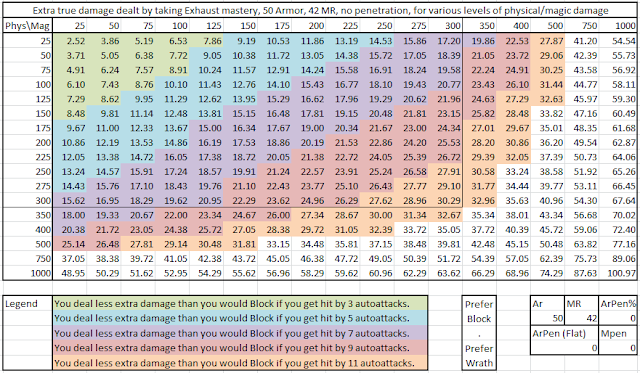 If you are going for an early all-in, you'll probably want the exhaust mastery; otherwise Block will save you from taking as much damage as Wrath would allow you to deal. However, if you have good sustain and want to guarantee a kill with a level-6 burst with your jungler helping, Wrath is probably still the superior choice. 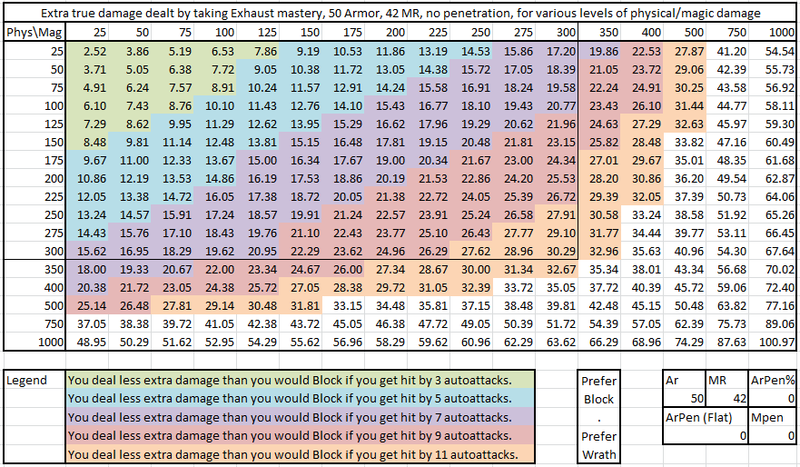 Here are some charts of the damage differential you get from having Summoner's Wrath as opposed to not having it. 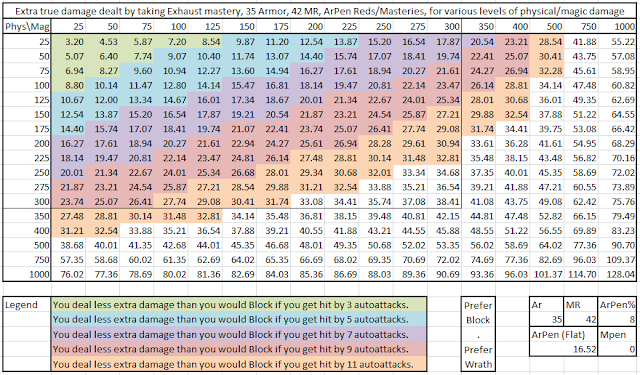 The way the chart works is that the row tells you how much physical damage you deal, and the column tells you how much magic damage you deal. 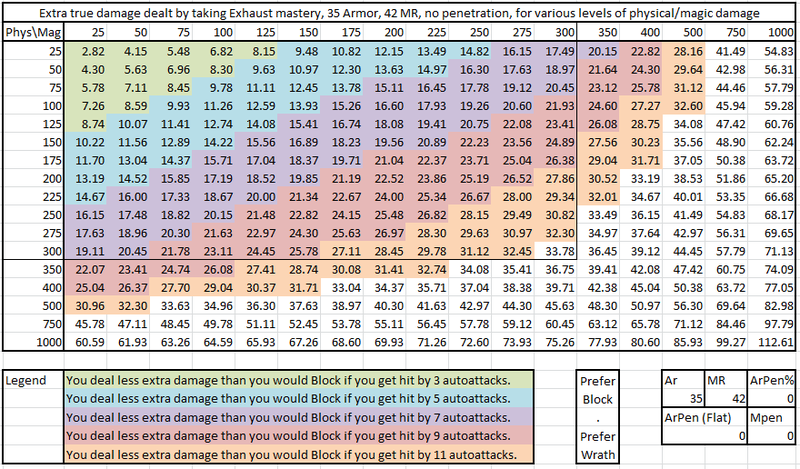 The number where they intersect tells you the difference in true damage that results from dealing that total amount of damage with Summoner's Wrath during an exhaust as opposed to there being no stat reductions. The charts are color-coded so that green means you'd much rather run Block, and orange means you'd much rather run Summoner's Wrath. 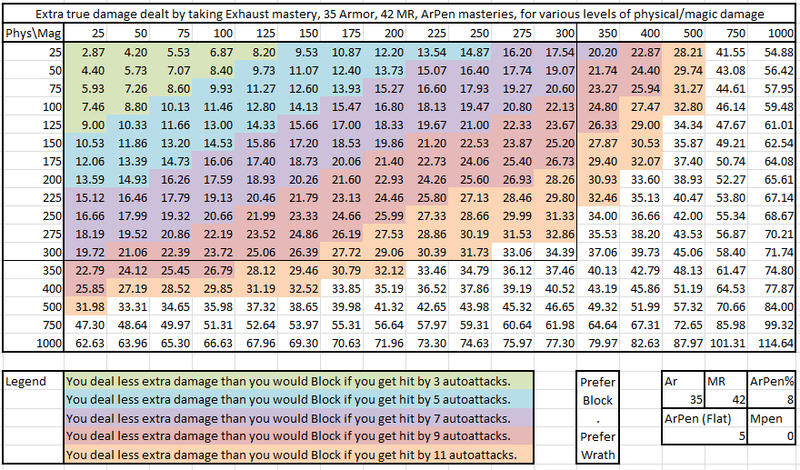 First, some values of armor and MR at level 1, with different amounts of armor penetration on the ADC: None; Masteries; Masteries and Reds; and Masteries, Reds, and Quints. For the level 1 damage, you're likely to be dealing two autoattacks from the ADC and two from the support, with also a physical-damage spell from the ADC, or about 300 physical damage. The amount of magic damage depends on the support but is likely to be near 75. 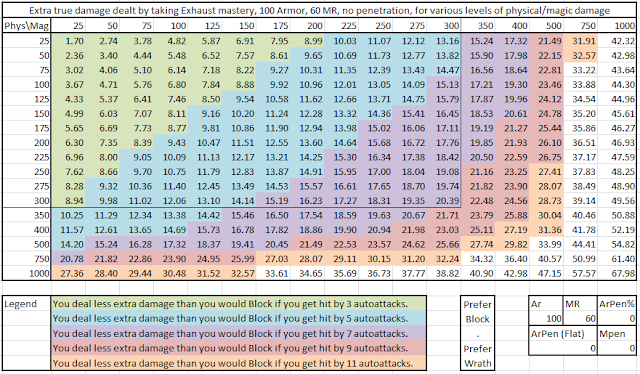 In this case, the exhaust mastery is absolutely worth it, especially when the ADC is running a significant amount of penetration. Now we examine some damage levels slightly later in the game, when the enemy has significantly more armor. However, the burst damage available will also increase. This chart represents a Zyra who is level 6 and has no additional armor or MR items beyond her base stats and a standard armor/armor/MR/(HP/GP10/MS/HyPen/etc.) page. 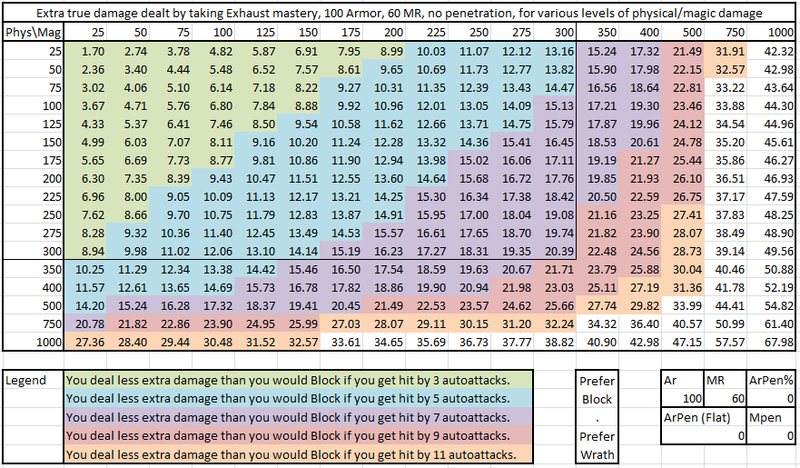 Various amounts of armor penetration are not listed because that makes the chart similar to above ones. And finally, this chart represents a jungler who might gank the lane with both an armor and a magic resist item. 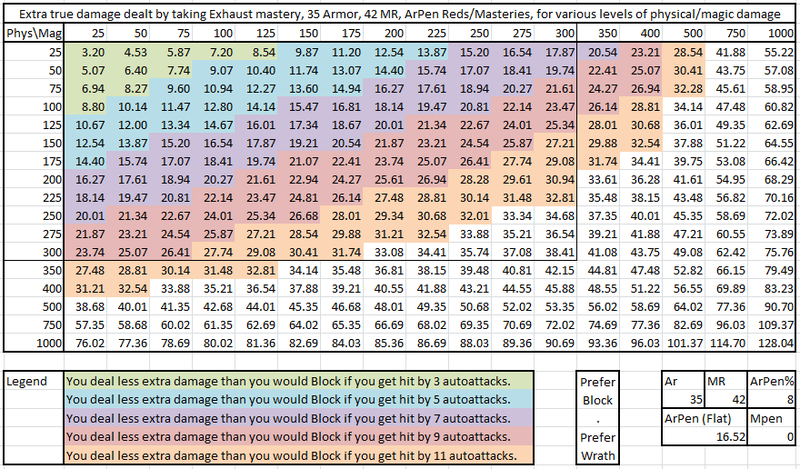 As you can see, having the armor/MR reduction is significantly less significant here than it was at level 1 against targets with very low defensive stats. Here is the equation that was used to generate these charts. 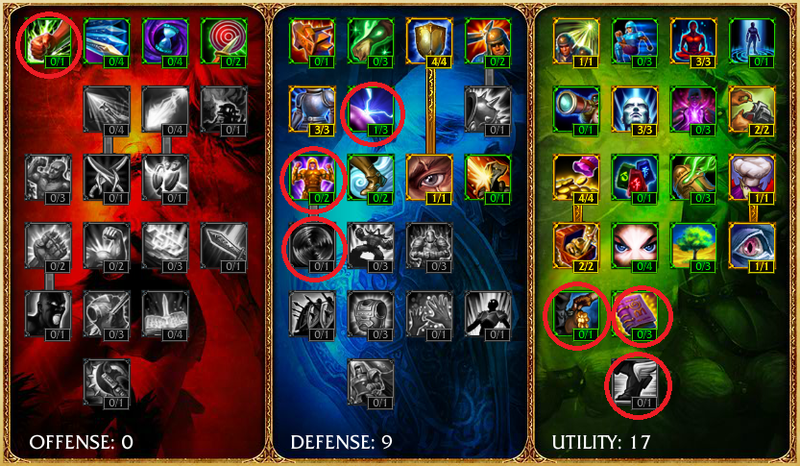 Note that Magic Penetration, both flat and percentage, is not included in any of these charts, but the option to include flat MPen is available and should be considered if the support is running magic penetration or hybrid penetration or if the midlaner is likely to come gank botlane early. Can my champion be played as a support?